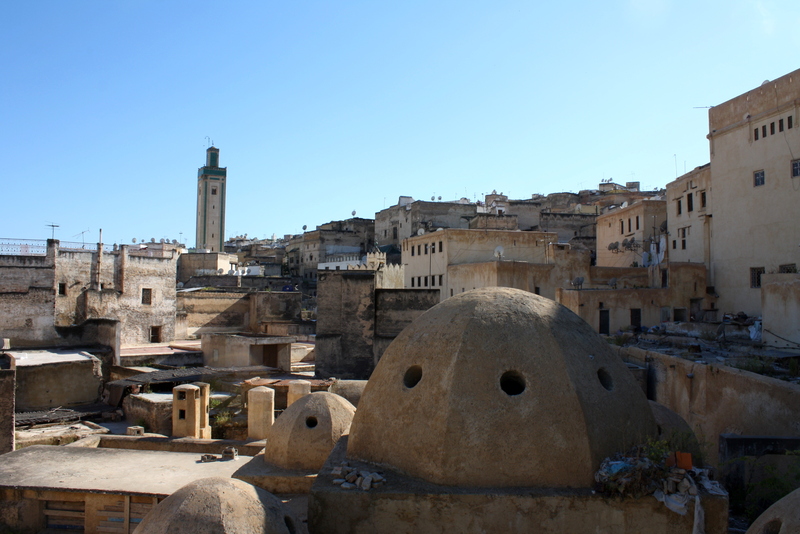 The Place As-Safarine, in Fes. I haven’t posted much about my trip to Morocco in April and part of the reason is a fear of trying to sound authoritative about a culture and history that I am not really a part of and that I am only just beginning to learn about. It’s not that the trip wasn’t striking, inspiring, and fulfilling–it certainly was. I just don’t want to sound like a neo-colonial travel blogger expounding on what a great time I had discovering all the great Moroccan wonders, when really it was a trip that followed a pretty typical touristic trajectory. I did want to share one of my favorite moments, though. On our first day in the country, my friend A. and I wandered the incredibly intricate and notoriously confusing Fes medina in an exhausted, sleep-deprived daze. Vendors called to us in French and English and ventured guesses as to where we might be from. We tried to give fellow pedestrians enough space to pass in the narrow paths but still got caught in more than one bottlenecked crowd. We dodged men pushing carts filled with various goods and yelling the typical “balak!” (“look out!”) and on numerous occasions, we narrowly escaped being trampled by small-but-feisty donkeys that seemed to appear from nowhere. A number of young children competed persistently to act as our guide and though we were acutely aware of the poverty around us, we also remarked how much better these kids’ English was in comparison with our students back in France. (In passing a famous medersa/mosque, one boy stated in a matter-of-fact way: “Would you like to go in there? Well you can’t. It’s only for Muslims.”) Between whiffs of fresh-baked pastries and other food items at every corner came the all-encompassing leathery smell wafting from the tanneries. Finally we came across the Place As-Safarine, or Square of the brassmakers, which we had read about. 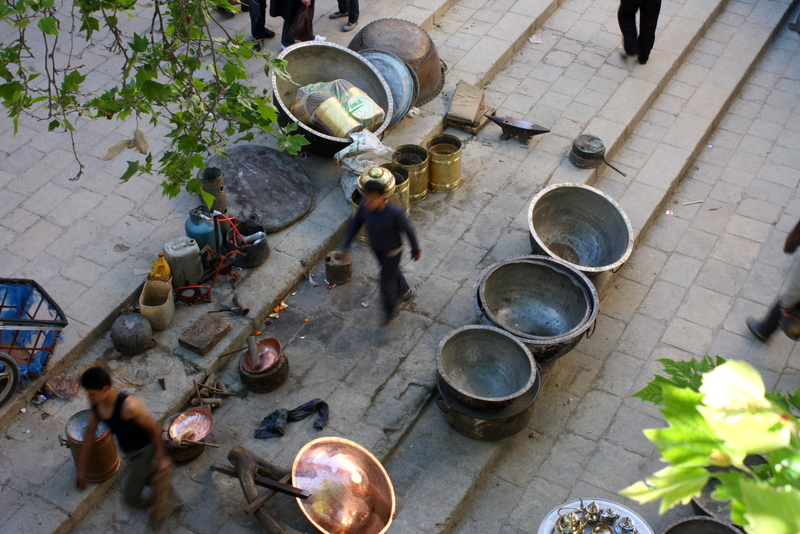 At first the noise was near deafening, as men crafting brass products by hand pounded at misshapen metal. It was a moment that we came to find increasingly common in Morocco, as we wondered how much of this display of a thousand-year-old tradition was still legitimately producing brass products and how much was just that–a display. But it was too loud to think much about how globalized capitalism has affected local craftwork anyway. We found a rooftop cafe on the square (another common and wonderful feature of Moroccan cities, though it is sadly limited to the sector of society that can afford them), ordered mint tea, and listened to the sounds of the metalwork. We didn’t exchange words for a long time. You would think the sounds of pounding metal would be utterly distracting: sometimes melodic, other times completely out of sync. But it occurred to me recently how much that travel-induced exhausted daze can be just the right thing at times, for in that moment I was not grumpy or displeased but merely too tired to think much of anything, or do anything beyond just be. We had no inkling of what the rest of the trip might bring, nor any idea what it would be like to spend two weeks with only each other. But it’s always a good harbinger when you can comfortably sit in silence with someone. Or if not silence, mind-numbing (in a good way!) noise.